We propose a framework for forming the development of object delivery services provided through cooperation among heterogeneous robots and sensors. For this, we extended the previous framework based on 4W1H abstraction to develop informative and physical robotic services. The proposed framework abstracts information about sensors and robots as 4W data for users, objects and robots, robotic functions, and property data of robots and objects. We then develop physical services done one by one in combination with service information. We also describe the service application development platform based on the framework. 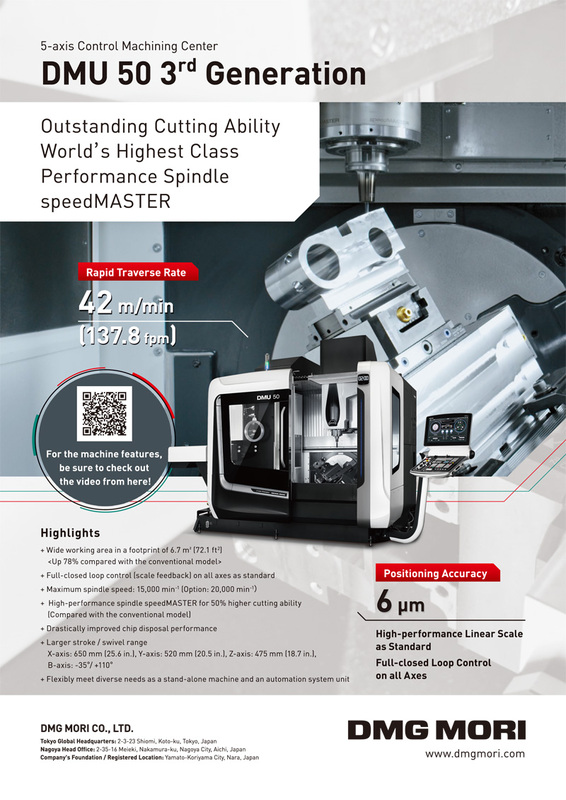 Experimental results show that service applications can be efficiently developed by using the service application development platform. Y. Nakamura, S. Muto, Y. Maeda, <. Mizukawa, M. Motegi, and Y. Takashima, “Proposal of Framework Based on 4W1H and Properties of Robots and Objects for Development of Physical Service System,” J. Robot. Mechatron., Vol.26, No.6, pp. 758-771, 2014. Ministry of Economy, Trade and Industry, “Report by the Robot Policy Committee,” 2006. Ministry of Internal Affairs and Communications Research Group on Network Robot Technology, “New IT from Japan Toward the Realization of Network Robots,” 2003. M. Mizukawa et al., “Special issue: Kukanchi: interactive humanspace design and intelligence,” J. of the Society of Instrument and Control Engineers, Vol.48, pp. 845-902, 2009. N. Ando, T. Suehiro, K. Kitagaki, T. Kotoku, and Y. Woo-Keun, “RT-middleware: distributed component middleware for RT (robot technology),” In Proc. of IEEE/RSJ Int. Conf. on Intelligent Robots and Systems (IROS2005), pp. 3933-3938, 2005. M. Quigley, K. Conley, B. Gerkey, J. Faust, T. Foote, J. Leibs, R. Wheeler, and A. Y. Ng, “ROS: an open-source Robot Operating System,” ICRA workshop on open source software, 2009. A. Makarenko, A. Brooks, and T. Kaupp, “Orca: Components for robotics,” In Proc. of Int. Conf. on Intelligent Robots and Systems (IROS2006), pp. 163-168, 2006. C. Cote, Y. Brosseau, D. Letourneau, C. Raievsky, and F. Michaud, “Robotic software integration using MARIE,” Int. J. of Advanced Robotic Systems, Vol.3, pp. 55-60, 2006. T. Hasegawa, K.Murakami, R. Kurazume, Y. Senta, Y. Kimuro, and T. Ienaga, “Robot Town Project: Sensory Data Management and Interaction with Robot of Intelligent Environment for Daily Life,” In Proc. of the 4th Int. Conf. on Ubiquitous Robots and Ambient Intelligence (URAI2007), 2007. T. Sasaki and H. Hashimoto, “Design and implementation of distributed sensor network for intelligent space based on robot technology components,” In Proc. of Conf. on 2nd Human System Interactions, 2009 (HSI’09), pp. 400-405, 2009. S. Ahn, K. Lim, J. Lee, H. Ko, Y. Kwon, and H. Kim, “UPnP robot middleware for ubiquitous robot control,” In Proc. of 3rd Int. Conf. on Ubiquitous Robots and Ambient Intelligence (URAI2006), 2006. M. Broxvall, M. Gritti, A. Saffiotti, B.-S. Seo, and Y.-J. Cho, “PEIS Ecology: integrating robots into smart environments,” In Proc. of IEEE Int. Conf. on Robotics and Automation, pp. 212-218, 2006. T. Nakano, S. Fujie, and T. Kobayashi, “Monea: message-oriented networked-robot architecture,” In Proc. of IEEE Int. Conf. on Robotics and Automation (ICRA 2006), pp. 194-199, 2006. H. Tezuka, N. Katafuchi, Y. Nakamura, T. Machino, Y. Nanjo, S. Iwaki, and K. Shimokura, “Robot platform architecture for information sharing and collaboration among multiple networked robots,” J. of Robotics and Mechatronics, Vol.18, pp. 325-332, 2006. Y. Nakamura, T. Machino, M. Motegi, Y. Iwata, T. Miyamoto, S. Iwaki, S. Muto, and K. Shimokura, “Framework and service allocation for network robot platform and execution of interdependent services,” Robotics and Autonomous Systems, Vol.56, pp. 831-843, 2008. S. Muto, K. Shimokura, Y. Nakamura, H. Tezuka, and M. Abe, “Feasibility Study of Platform-Based Network Robot Systems through Field Experiments,” The Trans. of the Institute of Electronics, Information and Communication Engineers D, Vol.J93-D, No.10, pp. 2240-2256, 2010 (in Japanese). M. Mizukawa, H. Matsuka, T. Koyama, T. Inukai, A. Noda, H. Tezuka, Y. Noguchi, and N. Otera, “ORiN: open robot interface for the network-the standard and unified network interface for industrial robot applications,” In Proc. of the 41st SICE Annual Conf. (SICE 2002), pp. 925-928, 2002. H. Kim, Y.-J. Cho, and S.-R. Oh, “Implementation and application of URC server framework,” inWorkshop on Network Robot System at 2007 IEEE Int. Conf. on Robotics and Automation (ICRA07-WS), No.SF-2-5, pp. 23-27, 2007. J. Furrer, K. Kamei, C. Sharma, T. Miyashita, and N. Hagita, “UNR-PF: An open-source platform for cloud networked robotic services,” In Proc. of IEEE/SICE Int. Symposium on System Integration (SII2012), pp. 945-950, 2012. Y. Kato, T. Izui, Y. Tsuchiya, M. Narita, M. Ueki, Y. Murakawa, and K. Okabayashi, “RSi-cloud for integrating Robot Services with Internet services,” In Proc. of 37th Annual Conf. on IEEE Industrial Electronics Society (IECON 2011), pp. 2158-2163, 2011. The Object Management Group, “Robotic Interaction Service (RoIS) Version 1.0,” 2013. 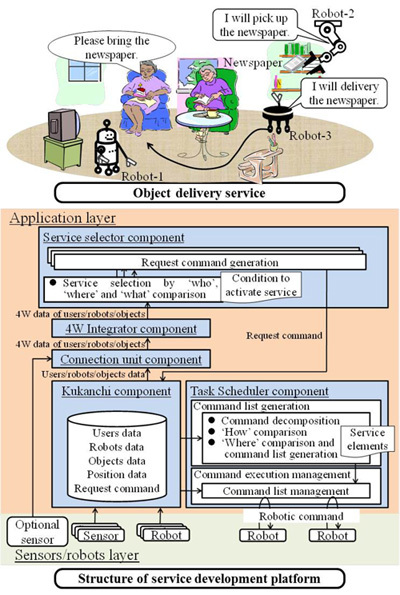 Y. Maeda, T. Yoshimi, Y. Ando, and M. Mizukawa, “Task management of object delivery service in kukanchi,” In Proc. of IEEE/SICE Int. Symposium on System Integration (SII2012), pp. 283-288, 2012. Y. Ishiguro, Y. Maeda, N. L. Trung, T. Sakamoto, M. Mizukawa, T. Yoshimi, and Y. Ando, “Architecture of Kukanchi Middleware: The Second Report,” In Proc. of 2011 IEEE/SICE Int. Symposium on System Integration (SII2011), pp. 283-287, 2011. Y. Nakamura, S. Muto, M. Motegi, and M. Mizukawa, “Proposal of Active Information Supplement Platform Based on 4W Information,” In Proc. of 2012 IEEE/SICE Int. Symposium on System Integration (SII2012), pp. 951-956, 2012.